The cover to issue #1. 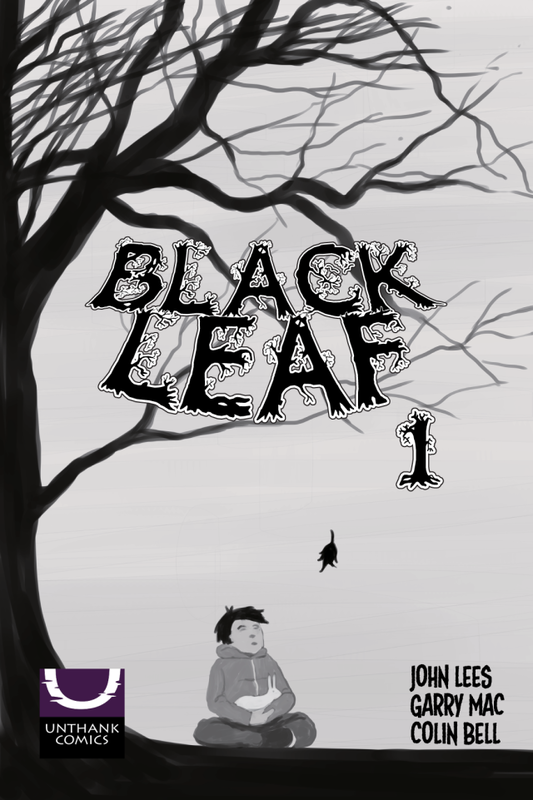 Ahead of its release this weekend at the MCM Scotland Comic Con, we were lucky enough to be able to take a look at Black Leaf #1, the latest offering from John Lees, Garry MacLaughlin and Colin Bell of Unthank Comics (a new Glasgow-based creator-owned comic stable). Serving as the first part of what is planned to be a 76-page graphic novel, the first instalment did a terrific job of setting up the premise of the story, establishing the main character and providing one hell of a hook to make me want to keep reading. I always try to avoid spoilers as much as possible in my reviews, but I’ll summarise as much as I can. The story, for the first issue at least, centres around Stuart Lockie, a young boy from Glasgow, and his relationship with his aging grandfather. Their relationship has a touching realism to it, and in fact the entire comic has a firm grounding in reality that makes the ultimate twist towards the paranormal a lot less jarring than it potentially could be. This isn’t a dose of B-movie horror, but rather a more detailed, intimate piece of character work that deals with the concepts of death and fear in a wholly relatable – yet still undeniably disturbing – way. That said, the revelations in the final few pages, as moving as they are, suggest that things may be set to take a twist for the horrific as the title moves forwards. Writer Lees has shown an almost chameleon-like ability to adjust his style to a wide variety of different genres, but combining this with his work on ‘And Then Emily Was Gone’, it seems that horror may be his natural calling. He weaves his tale around an incredibly believable, well-realised protagonist, while slowly – subtly – adding hints of the paranormal and the unnatural as the story progresses. The dialogue is strong, and perhaps most importantly (from my point of view, at least) he manages to establish the story without bogging the reader down with pages upon pages of exposition. Artist Garry Mac adds a new string to his bow here with a stunning back-and-white ink-washed style that marries up perfectly with the horror narrative of Lees. His clever use of shadow – particularly in the opening page – manages to convey the creeping sense of dread that permeates the book, and his page layouts, particularly those based in Bangirth Wood, are beautifully put together. I’ve always been a champion of lettering, particularly in small-press or self-published comics. And on this occasion, I think perhaps the greatest compliment I could pay to Colin Bell’s work is that… well… I didn’t really notice it. Lettering is something that is as integral to the flow of a comic as any other aspect, but is only really noticeable when it’s done badly. To that end, Bell makes a polished contribution here while still managing to add his own unique flair along the way. Also, in an interesting touch, issue #1 also features a ‘director’s cut’ style look at Lees’ original script and how MacLaughlin converts it into thumbnails. I always get a kick out of seeing these kind of processes, so it was extremely welcome to see it from a small-press title. Overall, Black Leaf #1 may not be for everyone, as it does have a fairly relaxed pace, taking its time to establish the characters and themes of the book. And, as a result, those looking for some ‘quick fix’ horror goodness would most likely be better suited searching elsewhere. But as an unsettling character study of a young boy dealing with grief and uncertainty, this is a stunning piece of work from all involved.